As the night start to draw in, the Crew thought they’d better make the most of the weekend. And so we headed down to Lyme Regis, a small town on Dorset’s ‘Jurassic Coast’. The town has a great sandy beach, another more exposed shingly one and one of the quaintest small harbours the Crew had ever seen. 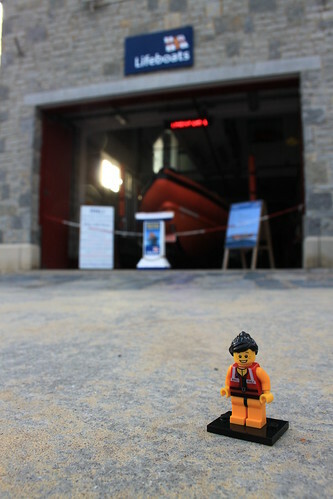 But more important, it also has its own RNLI lifeboat station. 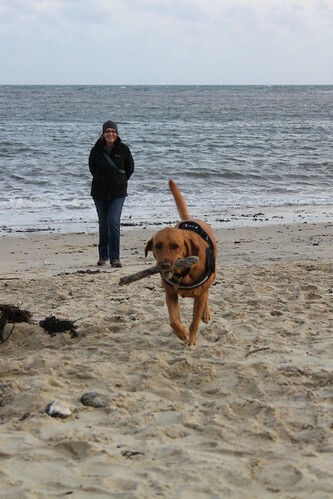 We started off with a short walk on the shingle beach to the west of the town. 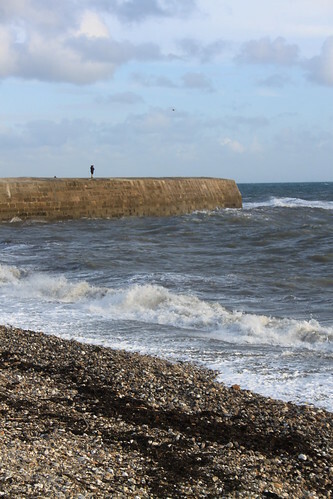 It was a fairly blustery day and the waves were battering ‘The Cobb’, which is the stubby wall that surrounds the harbour. Movie buffs will perhaps recognise it from the film (and the book!) ‘The French Lieutenant’s Woman’, where Meryl Streep stares forlornly into distance while awaiting the return of her seafaring lover. It was also, incidentally, in Jane Austen’s novel ‘Persuasion’. The Crew took extra care on the beach, mindful of the power of the wind and the waves. And the fact that they only weigh a few grams each, so could easily get blown down the beach or out to sea. Luckily, we’d thought to bring the Crew’s little LEGO baseplates, which at least meant that they were able to stand still for photographs. 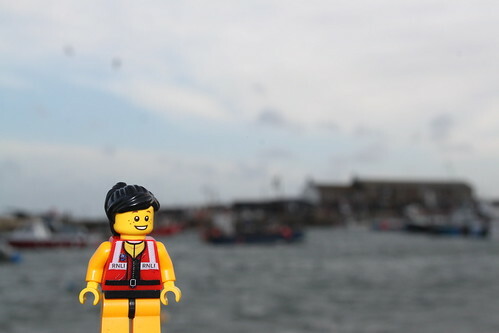 Our short walk over, we headed into town so that the Crew could visit the lifeboat station. Lyme Regis is home to the Atlantic 85 rigid inflatable lifeboat ‘Spirit of Loch Fyne’, which is housed in its own boathouse with a slipway leading down towards the harbour. With a crew of three or four, a top speed of 35 knots and room for twenty survivors, it’s an impressive piece of kit. Even more so when you learn that they cost over £200,000. 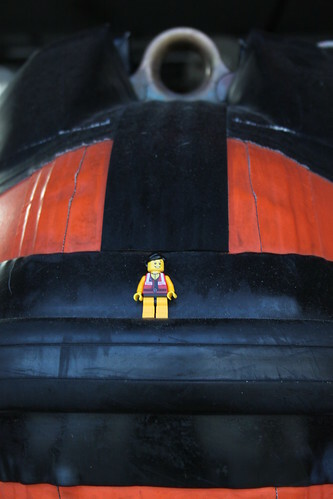 Some of the Lyme Regis lifeboat crew were tidying up around the boathouse and welcomed the little guys with enthusiasm. (And, if we’re being honest, with more than a little bemusement.) Several people walking past were also keen to find out what was going on and to meet the Crew. So we spent quite some time chatting and taking photographs. Here’s Crew Member Jackie with the ‘Spirit of Loch Fyne’. And here’s Jackie actually on the lifeboat, at the suggestion of one of the Lyme Regis crew. It was at this point that she, and we, realised quite how big the lifeboat was. 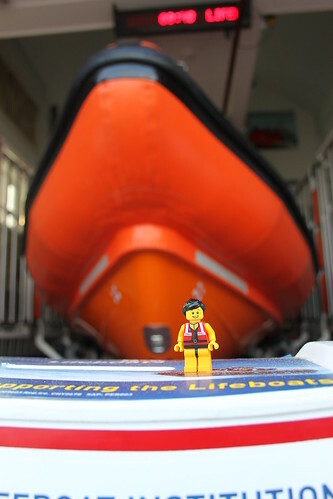 And this is one of the smaller boats in the RNLI’s fleet. After eventually saying our goodbyes and thanking the Lyme Regis crew for their hospitality, we headed along the beach towards the town centre. From here, we watched the comings and goings in the harbour and admired the little fishing boats moored up between the sturdy stone walls that hold the harbour in their protective embrace. The beach also provided my Labrador Molly, who up until this point had waited patiently on the end of her lead while I wandered around taking photos of the Crew (much of which involved me lying prone across the slipway in front of the lifeboat station, much to her consternation), with the opportunity to run around like a hooligan and to play with the other dogs that were doing the same thing. Here’s Molly. And Natalie, my equally patient wife. And so we all had a rather excellent day. 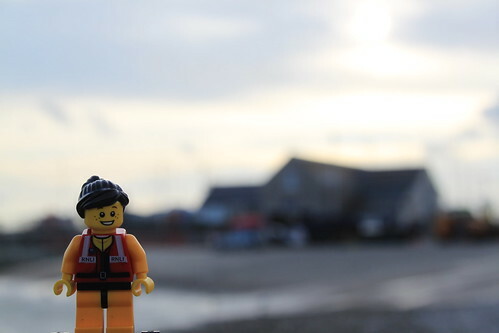 A big thank you to the RNLI Lyme Regis lifeboat crew for making us feel so welcome, as well as to everyone else who came over to learn more about the little guys and to tell us their own LEGO and lifeboat stories. It was an absolute pleasure to meet you all. 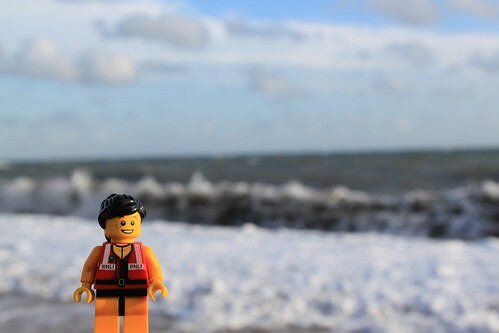 This entry was posted in Out and about and tagged Lifeboats, Lyme Regis, RNLI, The Lifeboat Crew by Simon Perks. Bookmark the permalink.